Summons a stack of 100 Hunter's Barbs. I was wondering if anyone knows if you can Shroud a character/group who is higher than 65 down to 65 in order to get the pouch to drop. I've done about 4 adventures with a shrouded group so far and haven't seen the pouch yet. I've also run a few at level 80 with no luck. After about 25 missions the pouch dropped off of a Trueborn Bloodgiver while we were shrouded. It conned as a rare creature. All group members shrouded to level 65. So I was leveling a warrior and wanted some arrows but didn't feel like leveling fletching. Then I remembered the pouch and looked it up. Went to bazaar and found it for sale.......for 400k. Looked it up and saw where it dropped and decided what the hell I'll make an sk/shaman combo to 65 and give it a shot. Assumed it would take a few runs at the very least to get this to drop. Twinked out both toons, got their adventure stones and went to Butcherblock. Got a boss mission and ran to the zone in. Zoned in with a tank/healer merc combo not knowing what to expect since I hadn't done an LDoN since they were current. Well I certainly didn't need any mercs. The sk twinked out was mowing through them easily. I kept out my mercs just to see how easy it was. Two times I wound up pulling at least 10 mobs at a time and barely broke a sweat on the merc healer/tank. Eventually I found the boss, killed him with a few adds tickling me at the same time and decided to just kill the whole place. Wasn't much left but as I went towards the area marked "boss" on my map (which isn't where I killed my adventure boss btw) I found a named Scion Extremist. Killed it and bam, pouch dropped. Yes it still drops(may 3rd 2016). My guess is you must be 65 and under. Two 65 toons and their mercs so average level of 65 and it dropped first time for me. I could have EASILY leveled fletching for a fraction of the cost and time I spent on these twinks. Just had this drop from a Scion Captain (16th March, 2015). Conned dark blue to level 64. Had 3 level 64s in the group and got a normal level collection adventure. 2 Characters - Level 68 and level 63. Each with one Merc. Average group level therefore was 65.5. Offered LDoN Normal which I took. [Tue Mar 18 17:29:22 2014] You have slain Scion Brutish Converter! Good luck - I did 3 LDoNs, killed a total of 5 named, and got it, but I know I was lucky. I'm 95% certain that this drops not from a max level ldon but rather a ldon where the group average is 62ish. I could be wrong but that's my very strong opinion. Hello been doing Mistmore missions for a few days now and killed the named listed and this item still hasnt drop'd for me. Can anyone confirm if it still drops? Dropped tonight off of a "Dishonored Trueborn Spirit". mission difficulty was normal on a collection mission, 65war/64ench/61cle for level average. So is there a particular LDoN to do, such as collection, rescue, etc. and does it need to be normal or high? Thanks. it says this items summons a stack of 100. At least acording to my item that is incorrect. This item was not updated when they made arrow stacks upto 100. This item still summons stacks of 20 hunters barbs. I stack of the 20 crystal reagents you need to summon the arrows will give you 4 stacks of 100 arows, not 20 stacks of 100....but it will give you 20 stacks of 20 if you store them like that. and to below poster, i think you can use at any level. The stats are correct. If the stats you see on your own item is not the same as what is listed, you can click the "modified" button that is below the stats on your specific item. This item is recommended use for lvl 63 ;therefore, anyone below level 63 will see modified stats. Once you click the "modified" button, it becomes an "unmodified" button and will then show the stats available at lvl 63 and above. Oh and the other posts are correct. When you click on the item, it summons arrows in stacks of 20. The purified crystal needed to cast the arrows does stack in stacks of 100. Good Fortunes to All !!! What lvl do you have to be to use this click effect? no level requirement...just need the components. Is there a required level to use the clicky effect? Anyone's knowledge would be appriciated! About 10 months ago i bought one on prexus for 4k, i took about 6 months off, come back and these things are goin for 20k!!! Dont know whats goin on if it still drops or not, but quite a price jump. I think the main reason for the increase is the fact that the Mistmoore LDoN adventure these drop in isn't done as often as it used to be,thanks to the intro of the DoN missions in Lavastorm and everyone's obsession with Radiant/Ebon Crystals. My 65 War got this from a guildie. I use it all the time. as a warrior you know that you will not be doing much damage with a bow anyway. tagging mob for rampage list. and best of all saving you from have to make or buy arrows. how many times have you ran otta arrows during the middle of a grind? this helps eliminate that. My war has 130 in fletching. i have since stopped the endless clicking to get 5 arrows at a time. the summoned barbs arnt good for anything other than freebe arrows. its like having a mage in a bag to supply you with arrows. basically a neat item that you will use often. the cast time is short, so you can get a bag full of arrows quickly. if 5K is steep for your price range...do some LDON and win it. its fairly common drop, prices in bazaar should reflect that now. Good luck and i hope you enjoy it. i use mine and dont ever see selling it. c) as a point of convenience, this takes one reagent for 20 arrows, rather than 4 components for 5 arrows, and there are no fails. This will save space in your inventory. Arrows have a 25 range? I'm relatively new to the game but wouldn't that completely neglect the long range on so many of the better bows? I currently fletch 125/150 range arrows with a fletching skills of 90. Not all that hard, just a little tedious. They aren;t magic, but I understand any of the "silver tip" arrows are now treated as magic? I'm not sure I would rely on this for my primary source of arrows but would be great for extended adventures when people inevitably run out. The range of the arrow adds to the range of the bow. A 200 range bow, with these arrows, has a total range of 225. This is plenty for most pullers, especially in LDON. When have you ever had a bow target out of range in an LDON? Only problem I have with this item is that the crystals to summon them aren't stackable as of this date =\ so a stack of barbs takes up an inventory slot even before you summon it. Darn. Yes the range is 50 now. 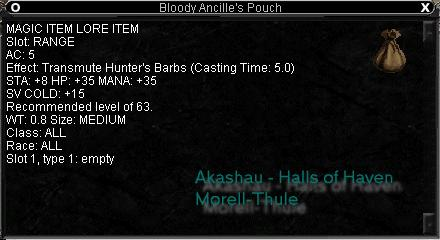 But when I first got the pouch, the summoned arrows range was 25. The Barbs range is 50 and the purified crystals used as the reagent are stackable, i recently sold my warriors pouch cuz i figured it be cheaper to do the fletching with my new little ranger and the ranger needs the practice with fletching anyway. Ok ok...call me an idiot...but now...instead of forgetting to buy arrows...i forget to buy the crystals...MEE DUMM OGAH! hello there - I am a cleric who acquired this item. I frequently hunt with my husband who could be on his ranger, warrior, or paladin depending on his mood...and almost ALWAYS forgets his arrows or runs out within 5 fights.../sigh . so I was being the good wife one day and now I provide him with arrows when he smacks his forehead and says (yet again) "DAMN...I forgot to grab arrows"! magically they appear in a trade window for him... . very convienent to have it if you are not able to summon arrows and handy in groups. very much suggest acquiring one no matter what your class, and your puller will be grateful that you were kind enough to think of him/her . oh yah...don't forget to go see any Magus (loc: wayfayer's camp) for the crystal (small green square looking). just my happy hunting! 1. Works from any main inv slot. 2. Crystals cost about 5 GOLD each. 5. Each stack of crystals = 400 arrows. 6. Allowing 1 inv slot for your summoning pouch, and using 8 Deluxe Toolboxes, you could *theoretically* carry 31,600 arrows. Yes it can be placed inside another bag. Crystals are 4gp 5sp from any Magus in any camp. The pouch will work in a main inventory slot, no need to equip it. RE: 50 RANGE NOW ! After patch Arrows are now Flaged MAGIC ITEM and have no stat bonus.